Pre-heat your oven to 350°F. With the tip of a sharp knife, slice each date open lengthwise and remove the seed. Put a cashew in its place and close the dates well. Next, roll one strip of bacon around each date. Secure the bacon with a toothpick to keep it in place. Then transfer the dates to a baking sheet covered with aluminum foil or parchment. Bake for 10-15 minutes or until the bacon is golden-brown. Serve luke-warm on a dish garnished with fresh parsley. The cashews can be substituted for almonds or pecans. Cheese also makes an excellent replacement; it will melt in the oven and give a rica, creamy consistency to the dates. This appetizer can be made in advance and baked last minute to enjoy anytime. If you don’t have dates on hand, you can easily use prunes as well. It’s always a good idea to have a full repertoire of bocaditos or appetizers to make for your next cocktail hour. In Peru we call them piqueos - the easier they are to make, the better! This stuffed date recipe is extra convenient because you probably already have many of the ingredients in your own pantry or fridge, like the bacon. Since you can improvise this appetizer in the moment, you’ll always be ready with a gourmet snack on hand in case of an unexpected visit. 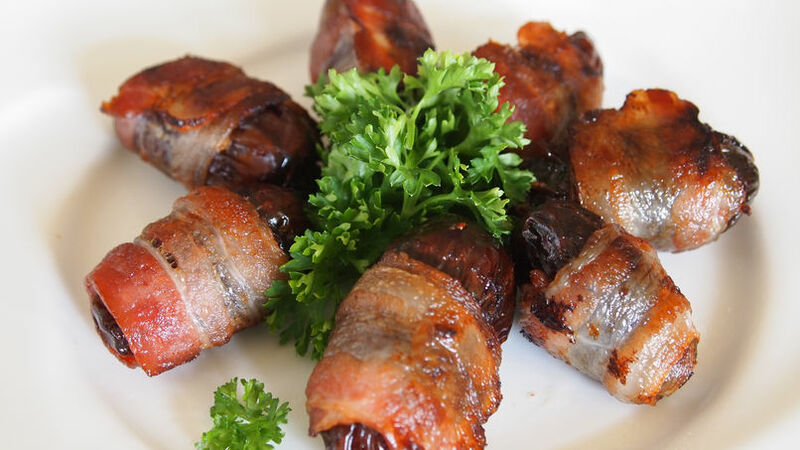 The dates in these rolls add a natural sweetness that, combined with the smoky flavor of the bacon, creates an incredible combination of sabores. The cashews also give a contrasting note of texture, but if you prefer, they can be replaced for diced cheese. The important part is that the bacon should be served golden-brown, without any fat visible. Your guests will be left surprised by these rolls that look elaborate, but can be prepared in a snap.